Federal officials spend as many as 120 days working with and observing executives in the public or private sector when they enroll in a special leadership program that the Office of Personnel Management has sponsored since 2003. Most executive candidates in the program select their leadership partners from another federal agency. Mark Chait, 43, a special agent at the Bureau of Alcohol, Tobacco, Firearms and Explosives, selected his from the private sector. The agent in charge of the New Orleans office — he will become deputy assistant director of public and governmental affairs in June — said he believes that understanding how industry handles executive issues gave him a new perspective on management. His partner in ATF’s Senior Executive Service Federal Candidate Development Program is Mike Carpenter. Carpenter, 30, is vice president of federal operations at McAfee, a company that makes information security software. OPM designed the program to help ease federal managers into senior executive positions. “I just see this as looking through another lens,” Chait said. OPM ran its own version of the SES program in which any federal agency could participate, but it has since put that on hold in favor of agency-specific programs. Agencies use OPM’s program guidelines as a basis for their candidate development programs and must receive approval from OPM before instituting them. During the shadowing portion of the program, Chait visited Carpenter to observe almost all aspects of his work, including weekly meetings, customer visits at federal agencies and even private meetings. “It was amazing that government agencies were very willing to let Mark into the conversation,” Carpenter said. “I’ve got stories to tell,” Chait said. Carpenter said he tried to accommodate Chait by holding business meetings at Tysons Corner, Va., roughly the midpoint between the McAfee offices and ATF, where Carpenter would gather his team’s employees to help them focus on overall goals. Carpenter and Chait met through a mutual friend. Although they work in organizations with different management hierarchies and goals, Chait quickly discovered similarities in management and communication styles. The biggest surprise to both of them was discovering identical challenges in managing employees. Both found that younger employees prefer more feedback from managers than older workers. Carpenter described one employee who preferred to communicate only when it was necessary to solve a problem. Carpenter said that if he distanced himself from younger workers in the same manner, they would probably quit because they would feel as though they were being ignored. Managing a younger workforce is one of Chait’s biggest concerns because the bureau is experiencing greater-than-usual employee turnover. Although the mandatory retirement age is 57, many ATF field operatives are choosing to retire as early as 50, Chait said. “ATF needs new people. Our turnover is increasing on a yearly basis. I think ATF is putting money behind this program to fill those gaps,” he added. Both saw managerial characteristics that they admired in each other. Carpenter said he liked Chait’s back-to-basics approach to management, while Chait said he admired Carpenter’s ability to communicate ideas and convey his vision to employees and others. Both men spoke positively about their experience working together. “Mark going to the private industry meant a lot to us [because] it was like the government was reaching out its hand to us,” Carpenter said. 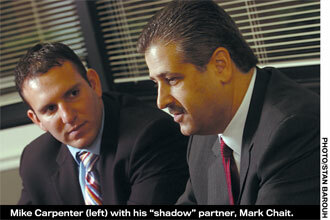 Chait added that he hoped their business relationship would open more opportunities. “I’d consider us friends now,” he said. Training Senior Executive Service leadersThe Senior Executive Service Federal Candidate Development Program seeks to expose employees at General Schedule 14 and 15 grade levels to different managerial styles before promoting them to the highest leadership levels in the federal government. The 12- to 14-month program has a graduate school-style structure. Managers enrolled in the program undergo an orientation and skills assessment before beginning classroom courses. The program lets them interact with Cabinet-level officials and create a training plan to develop specific skills. Candidates then begin the program’s hands-on portion, which includes shadowing other managers to learn about different managerial styles and functions in government. SES candidates also design and lead projects. Finally, the SES Qualifications Review Board evaluates candidates, and the successful ones attend a graduation ceremony. After graduating from the program, they are eligible for an SES position anywhere in government without going through the usual competitive federal hiring process.